Pop Up Christmas Tree Cone Puppet is a traditional peek-a-boo puppet with a Christmas theme that "Pops" out of a cone and gives a lovely surprise. 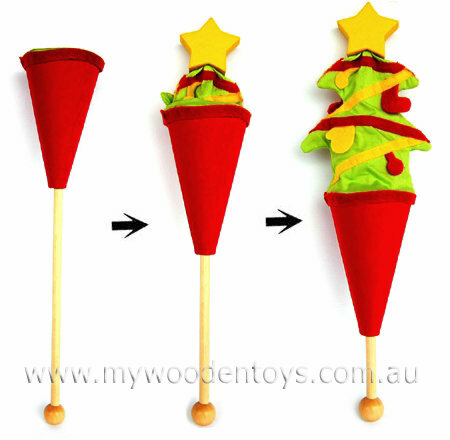 The little cloth Christmas tree jumps up out of the red cone when you push the wooden stick up. This Christmas tree has a lovely yellow wooden star on the top and little felt decorations. Size: Popped up the length is 26cm, star is 4cm across. Material: Wood with Child safe paint. Cotton, Felt. We like this because: "Babies love to see this pop up again and again."